A simple resolution to the 'faint young sun' paradox? | Watts Up With That? A simple resolution to the 'faint young sun' paradox? The ‘faint young sun’ paradox states that according to star models, billions of years ago the Sun would have only been about 70% as bright as it is today. Given the same environment as today this would result in most water on Earth being frozen making early life difficult to exist. However, geological history does not show such a frozen Earth period and early Earth is thought to have been quite warm. Most solutions to this problem relying on an enhanced greenhouse effect or on cosmic rays and clouds. To me these solutions, while possible, ignore much the simpler explanation of a shorter Earth day. The Stefan-Boltzman law/equation states that, at equilibrium, the outgoing radiation from a black-body equals incoming radiation (from an external source) and is proportional to the fourth power of the temperature of a black-body. which only has an average of 1.45; significantly less than 2 from the more even distribution. A fast spinning Earth distributes temperatures more evenly allowing for a significantly higher average temperature than a slow spinning Earth. The faster the Earth spins, the higher the average temperature. Billions of years ago, the Earth was rotating up to twice the rate it is today (it has slowed over time due to tidal friction). All else being equal, this would have distributed temperatures on the Earth’s surface more evenly and resulted in a higher average temperature. Since the Sun was also weaker the two effect may have roughly canceled each other out. 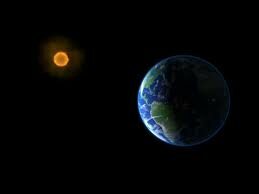 The Earth is not a black-body, but reflects a significant amount of light. Reflected light is not available to heat up the Earth’s surface and therefore has a large effect on Earth’s temperature. The reflection coefficient is also known as albedo. Water in solid state (snow, ice) has a very high albedo compared to water in liquid state or soil. A small increase in temperature can cause some snow to melt, reducing albedo and causing temperatures to increase further. In this way water provides a strong positive feedback; amplifying small changes in temperature. It is this effect that likely drives the Earth into and out of ice-ages by amplifying an otherwise small external forcing factors such as changes in Earth’s orbit. Similarly this positive feedback mechanism could work to amplify the increased average Earth temperature due to faster Earth rotation of an early Earth. I always wondered why there were only 12 hours on a clock. Earth’s atmosphere was denser in the past. That’s how you support dragonflies with three foot wingspans, and that’s where the adiabatic lapse rate makes the surface warmer. The problem I see on this logic is, earth temperatures are not like 1 2 4 2 1 but more like 281 282 284 282 281 (in Kelvin) – the difference, even to the power of four, isn’t that big. This assumption is not a given … a faster spinning earth can lead to greater latitudinal stratification, and less well distributed temperatures. Well when you say it like that, it sounds rather simple. The problem is, that the rotation rate of the earth; other parameters remaining the same, does not alter the duty cycle of solar heating one iota. Any spot on earth will receive the exact same total insolation in a single rotation, regardless of rotation rate..
Then you have to consider that 70% of the earth surface is ocean, and considerably more than 70% of the tropical earth surface is ocean, where the sun is incident more normally, through a thinner air path. It is true, that during the mid day hours (tropical) a given spot on earth’s equatorial region, will be under direct sun for a shorter period, with faster rotation, so the daytime surface heating would be less. That means as we well know, there would be less evaporation from the ocean and hence less cloud in the sky to increase earth albedo, so we would have a lower albedo, not a higher one. The albedo contribution of polar ice is nowhere near the effect of tropical clouds. Clouds are NOT a warming effect. They scatter sunlight to space so it never reaches the ocean, and in their evaporation, convection, condensation cycle they convey huge amounts of thermal energy into the upper atmosphere where it ultimately is lost to space as thermal radiation. The simple fact that clouds and water in the atmosphere are a NEGATIVE feedback regulating mechanism, and not a POSITIVE feedback runaway mechanism, makes it entirely uinnecessary to search for answers to the so-called faint sun paradox; there is no paradox. Water feedback regulates earth Temperatures whether insolation change is caused by solar cycles, or faint sun scenarios. Now earth orbital changes, that shift the axis tilt and change the seasonal cycles, will result in shifts in energy flows around the earth depending on where large land masses, and water areas are located; but for a given set of orbital parameters, small changes in total insolation are masked by cloud feedback. Earth’s seasonality is more a consequence of axis tilt, than it is of TSI. The earth is closer to the sun in Northern winters, than it is in northern summers, so clearly insolation is not the cause of northern winters, axis tilt is. This is an important contribution to the dim sun paradox conundrum. An exact counter-balance between increasing insolation and temperature loss due to decellerating rotation would seem very fortuitous – almost like a religious anthropic argument (although of course this does not logically mean that it is wrong). The daisyworld (Gaia) hypothesis of Lovelock and others is however, in my view, a very persuasive hypothesis, backed up by extensive and varied computer simulations. They have made a strong case that ecosystems of organisms under evolutionary pressure do robustly modify (regulate) their enviroment to suit their physiological requirements. So with the dim sun as with the CO2 question, the earth’s climate is as much about biology as it is about physics. Obviously that isn’t true for one “daily rotation” , I should have made it clear that was one rotation around earth orbit; a year if you will. Since the earth sun distance changes daily, talking about one day events is not realistic. But the daily heating / cooling duty cycle is the same regardless of rotation rate. IDEAL GAS LAWS, basic physics…..
greater pressure allows the atmosphere to hold more of the incoming heat. Day and night temps vary by more then a couple K.
His example is obviously exaggerated to for illustration purposes. The last paragraph does not mention water in vapourised state – clouds; and their contribution to albedo. This might at least reduce “the strong positive feedback” of water? I saw a scientific documentary a few months ago, that explained that at one time millions of years ago our planet was a 100% ice planet. We are still an ice planet, but that phase ended due to volcanic activity. So there is some truth in this. Now I’m no physicist but has the following observation got any relevance? On a faster spinning earth, the side exposed to the sun (the daylight side) would not be exposed to the incoming radiation (source of the heat) for as long and would therefore not heat up as much as it currently does. In 1998, Harvard University issued the following in their gazette. We are talking around 700 million years ago and they suspected it was then the sun was dimmer, and little CO2 in the atmosphere that sustained the planet being completely covered by ice. Volcanic activity increased the amount of CO2 emitted into the atmosphere that naturally warmed the Earth. I think I would credit Harvard University with publishing the truth, wouldn’t you? Wouldn’t the young Earth have been in an orbit closer to the young Sun? Non sequitur. ‘A fast spinning Earth distributes temperatures more evenly allowing for a significantly higher average temperature than a slow spinning Earth.’ – How does this relate to incoming radiation? The integral is the same irrespective of the time-scale. Not to say this idea is completely without merit, but it needs a lot more work before it gets any where near being a valid suggestion. The faster spinning Earth allowed dragonflies with three foot wingspans to fly due to centrifugal force. This argument doesn’t take account of the fact that the ocean doesn’t cool down fast at night. It is a vast store of energy why maintains night-time air temperatures near bodies of water. This is 75% of the planetary surface area. An interesting and fascinating idea, me thinks. I have read that the moon orbit was much closer as well as being more volcanic activity on that early Earth. It was in effect a vigourously rotating petrie dish. Mike McMillan has the correct answer, thicker atmosphere. Ian needs to drop the chalk and back slowly away from the blackboard. A simple empirical experiment can show the influence of a thicker atmosphere. Take two identical containers largely transparent to SW visible and LWIR radiation. Within each chamber place an identically sized matt black target surface. Use a small hole to ensure one chamber maintains 1 bar pressure. Use a pump to increase the second chamber to above 1 bar and a water column regulator to ensure the chamber maintains a constant pressure during heating (1.2 bar – 2m column is sufficient). Within each chamber enclose a thermometer probe shielded from incoming and outgoing radiation. Equalise the starting temperature in each chamber then expose each to an identical amount of SW radiation. The chamber with the higher pressure heats faster and higher. No chalk or blackboards required. Ian, when you have built and run this experiment you may look at designing one to explore the concept that condensing and non condensing radiative gasses in Earth’s atmosphere have a net cooling effect. I had always assumed our planet was closer to the Sun (and therefore closer to the heat source) and had been steadily moving outwards – just like the moon – over the past 4.5 billion years. Shorter Earth Day? Are you mad? We need longer! Earth Day is vital to promote understanding and appreciation of this fragile planet. It is an important day for self-righteous left-over hippies to get together and grok nature. It is an important day to celebrate of the birth of Vladimir Lenin. It is an important day for preach-ins and for brainwashing the children and getting their minds green. Oh noes, the earth is slowing down we’re all going to freeze…must be all the (man-made) windmills – can’t just be the (natural) tidal friction. Well … just maybe. One problem is that we don’t know what the Earth’s atmosphere 4.5B years ago looked like. Little or no Oxygen. We didn’t get that until most of the Iron was locked down in relatively insoluble forms billions of years later. Probably some Hydrogen. Nitrogen and water vapor probably. Carbon Dioxide?, Methane? So we don’t really know how it reacted to incoming and outgoing radiation. radiation extremes for today’s earth. The faster rotating ancient earth would presumably have been less. Picking a number out of the air — 7%. I think that would give us 15%-7% = 8% warming. Not enough. We need about four times that to account for the hypothesized fainter young sun..
Of course, my estimate is just a cocktail napkin estimate by someone who doesn’t know what he’s doing (I think that qualifies me as a climate scientist, right? Where’s my grant?). But the numbers don’t seem to look very promising. Ian, the Stefan-Boltzman law doesn’t say anything about incoming radiation. It simply states that the emitted radiation is proportional to the fourth power of absolute temperature – as in your equation. Kasuha, I don’t know where you live where the temperature never varies by more than a couple of degrees but the range of Earth surface temperatures is closer to 100 degrees. So using the average surface temperature to calculate the average emitted radiation is not valid – as pointed out in the article. The early earth would have had 3 major heat sources: the sun, decay of radioactive isotopes (which would have been even larger than now), and residual heat from its accretion. This last would have included a major component from the heat produced when Theia impacted the proto-earth to produce the current earth-moon system. “There is no direct evidence to show that carbon dioxide levels were ever a thousand times higher. Jenkins thinks he has a better way out of the paradox. He and two colleagues at the University of Michigan, Hal Marshall and William Kuhn, propose that Earth’s rapid rotation rate and the absence of large landmasses 4 billion years ago were the keys to the planet’s warmth. In their model, Jenkins and his colleagues used a 14-hour day and also assumed that Earth had no land. That is not a bad approximation, says Jenkins: most landmasses formed less than 3.5 billion years ago. Before then, Earth’s surface was probably one vast ocean dotted with volcanic islands. Lesser cloud cover meant less shading from clouds and thus higher surface temperatures relative to the amount of incoming solar radiation than would otherwise be the case. Although talking about variation on far lesser timescales is a less extreme situation, cloud cover continues to matter in recent climate. For instance, the global cooling scare ended when solar activity rose after cycle 20 (1964-1976). The two cycles from 1976 to 1996 had a stronger solar magnetic field with more GCR deflection leading to 3% less average cosmic ray flux (oulu.fi), fewer shading clouds, and the global warming scare. Then, in the late 1990s, Earth’s albedo trend and the trend in cloud cover changed, and, in no coincidence, after the 1998 El Nino, relative temperatures from then on have been flat to cooling ( http://www.woodfortrees.org/plot/rss-land/from:1998/to:2013/plot/rss/from:1998/to:2013/trend ). I agree with Mike McMillan. The atmosphere of the ancient earth was supposed to be much thicker and denser. That was enough to raise the temperature higher than today, even with a fainter sun. Really? Night in your place is only 3 K colder than day? Wouldn’t the simpler explanation be that they miscalculated the brightness of the sun? Didn’t God do this in 7 days ? Is it not also a factor that the dark side loses heat at a rate that is not linear wrt time. Therefore, a variation in night length would have a possibly complex effect on the global heat balance. I’ve seen this quoted as a reason why it is hard to model heat variations on other planets irrespective of albedo ot atmospheric variation. Faster rotation can not increase daytime high, but can only reduce night time low temperature. So you are added to average average, e.g 20 + 0 divide 2 equals 10 C .
But instead just adding to 0 C. So if range is 5 C to 18 C, the average is only 11 C, but it’s well above freezing, so ice easily melts. How about if we had a longer day- and therefore longer nite. The day time wouldn’t get much warmer but the night would get significantly cooler. If a longer day did add significantly to high daytime average- one has longer days at higher latitudes in their summer one can have day light longer than 16 hours, and one isn’t getting very warm conditions as result. You aren’t going to break world daytime temperature highs in these regions. But more significant, I don’t think your current rotation is at all counted in the simply model where Earth suppose to a blackbody and greenhouse gases are suppose to add +33 C.
And seems rather obvious that that Moon couldn’t get to 100 K at nite, if it’s day wasn’t 28 days long- if had 12 hour nite, it simply would not have enough time to cool this much. You got it right mate, the atmosphere was like a thick soup, and totally different in composition to now, probably closer to Venus. We were more fortunate, being a little further from the sun and evolving with life. Lucky us. “Models of stellar evolution predict 25% less” means this is a hypothetical paradox. What is real is the Jurassic fossile records of 11 meter Pterodactyal and current 5 meter Peruvian condor, along with half meter [twenty inch] Meganeura Dragonfly and current quarter meter Atlas moth wingspans. Of the four parameters for flight, thrust, lift, drag and gravity one must assume that lift as a function of wing area would be the limiting factor on wingspan. Therefore the Jurassic was at least double, or since wing area is a square, then four times the present atmospheric density. This solves the dinosaur hot-cold blooded issue as well. Most likely the atmosphere has undergone continious decay since origin. The Lunar polar ice caps are accreation from billions of years of full Moon passage in the solar wind eroded Earth atmosphere. The paradox is then, why do so many fall for every hypothesis. AAhhhhhh yes!… that would also explain the dinosaurs long necks! Interesting. By the same token would it not be the case that cloud cover causes a greater uneveness in temperature and therefore an additional lower averge temperture? Similarly ice caps? After all the distribution of both is somewhat patchy? If you are right here it would seem that something very significant is being missed. Venus’ days are 110 Earth days long. Think of how much energy accumulates on the surface and in the atmosphere when the Sun is up for 2240 straight hours. Strong winds then transfer that heat accumulation back to the darkside. One can calculate the numbers and get something close to what Venus temperatures are. Now take an early Earth where it heats up less during the day but cools off less at night. The average temperature change between day and night is then only half of today or just 5C on land, less than 1C in water, less than 1C at the tropopause. Still leaves us short but more stable. Less freezing then in the mid-latitudes given warmer nights but cold enough enough at the poles that there is large, large sea ice areas and high overall Albedo. We still need something else. I call this the wet earth fallacy. I believe most of the water on earth was accreted from space, AFTER it’s initial formation. Their hypothesis is based on a static volume of water on earth, which I think is clearly wrong. It was the moon that caused the Earth to be warmer when the sun was fainter, It was much closer to earth than it is today and has been moving away for millions of years, a closer moon would make tides much higher, it would have a larger influence on the tectonic plates and cause more movement, there would be more energy in the system and volcanic activity would be higher, the atmosphere would be denser, and possibly earths gravity was weakened and electromagnetic activity would have been much higher including flipping the earths magnetic north and south poles more frequently, the speed of the earth would be a minor factor but it can be measured so it’s important, The rate at which the moon has been moving away and slowing down would be equal to the slowing down of earths rate of spin. How about all the models are wrong. There is almost no raw data as to time – is the rock 100,000 years old or a billion, what there is relies on speculation and assumptions as there isn’t a time machine we can put a rock into and see it 1M years later, things like rates of erosion can change but that ruins the calculations. I know why it is so hard to dissent from the consensus, but instead of trying to resolve two very conflicting dates with even more epicycles, can’t we just say we don’t know or one is wrong? Is that too ecentric? Or are we bound to keep going in perfect circles? One day., two at most. … If you believe Genesis. Actually, He knocked it out in 6 days so He could catch the Game of the Week. That a faster rotating earth -distributing heat more evenly- would sustain higher temperatures seems to make sense. One other factor to consider. If the earth rotated faster and the moon orbited faster (and closer) around it, the tidal (and perhaps Coriolis) effects would have been greater. All that shifting stuff around would also have generated more heat. For a more extreme example. Whatever the merits of Don K’s back-of-the-envelope estimate may be, they point up how shallow the main post was; the author shouldat least have given us calculations of that type. Having failed to do so, he has wasted our time. 1. Maybe the earth was closer to the sun in the past, the moon recedes from earth a few centrimetres a year, and tides were greater in the past when the moon was closer to earth. 2. Maybe there was more volcanism and geothermal activity, although I have heard this often with pictures of dinosaurs against a backdrop of volcanos, I’ve never seen any real evidence for it. Continental drift is ultimately driven by radioactivity in the earth’s crust and mantle, this may have been higher in the past, meaning more tectonic drift and more volcanos. I also read somewhere that Venus once had continental drift, but this shut down some time ago. 3. Maybe the sun wasnt that faint. 4. Maybe the earth has a fairly strong thermostat, responding to T changes by adjusting its thermostat. 5. Maybe the earth was frozen, I’m not sure the geologists are certain that it wasnt. 6. Rotating faster would likely have also meant more geothermal activity. Ever noticed that South America, Africa, Australia are sitting upright with respect to the roation of the earth? I suspect this is because of centrifugal forces on continental land masses, places like New Zealand trend oblique to the earths axis due to local strong volcanic/tectonic factors, which over-ridge centrifugal forces. The boundary of plates might also be effected by the rotation of the earth, it would be surpising if they weren’t, after all, when a plate splits, why wouldnt it split along stress trends determined partly by the rotation of the earth? Wouldn’t a faster spinning earth create much higher wind velocities? If yes, would this increasing convection of heat from the surface to the upper atmosphere? Interesting. Water melting requires heat, latent heat, when this evapourates more latent heat is required which will cool the surface. This heat is released when clouds form to escape to space. So a negative feedback. But certainly earth did rotate faster back in geological time. For water read ice. Sorry folks. W/o reading the post, I thought the early faint sun was compensated by a considerably higher atmospheric pressure. Perhaps earth had a single Hadley-cell circulation like Venus, which is a very efficient heat-transfer mechanism. Interesting article, and a lot more persuasive than the top article here, although the top article does point out correctly that anything that reduces the variance of temperature distribution contributing to some global average temperature is net warming all things being equal, which sadly is almost never true in climate science. One thing discussed in the article that I found very interesting was the fact that the radius of the Earth’s orbit would have been smaller around the more massive young Sun (it loses mass steadily from “evaporation” into the solar wind). Indeed, the intensity of insolation scales like where is the orbital radius, and for a given fixed orbital angular momentum that radius scales like , so it is inversely proportional to the mass of the sun . This means that insolation intensity would be proportional to (exclamation point!). If the mass of the sun were 20% greater during the Archean, that would compensate for the a solar power only 70% of today’s. A nonlinear effect on top of this is the coupling of rotationalangular momentum of Earth and Sun to orbital angular momentum via the solar tides, which would have been similarly enhanced by increased solar mass and decreased orbital radius. The Sun’s “day” and Earth’s “day” were much shorter (the top article is of course devoted to the latter as part of its basic hypothesis) and the Earth’s orbit would have been even closer than strict scaling suggests because the Earth’s orbital angular momentum has not been been constant over that period — it has coupled a fraction of both its own and the Sun’s rotational angular momentum into its orbital angular momentum, decreasing insolation intensity like the orbital angular momentum of the earth to the inverse fourth power. I don’t have a good feel for this — the moon is moving away from the Earth at a rate of a few centimeters a year (and was around half the distance it is today when the Earth/Moon system was young, which may also have had a significant effect on the climate). If the Earth is moving away from the Sun only a few centimeters a year, it is a nearly negligible change in Earth orbit as far as net insolation is concerned, but I don’t know what the numbers really are, centimeters or meters. Finally, it isn’t just variation of the semi-major axis that counts, it is also eccentricity, which varies considerably over time due to orbital resonances. The entire solar system would have been more compact around a more massive Sun, and so all of the orbital resonances would have been much stronger. A hard problem. But I like a more massive sun as a proximate cause and solution to the paradox, or more likely, a big part of that multifactorial solution. So…??? Dump truckloads of AMP Energy drink down that hole to the core of Earth and mega-flora returns? Don’t put Monster down there, spin rate out of control! Well, there is always the Iron Sun and Electric Universe ideas. Or is that sentence going to get me a time out? OK, after reading the post, faster revolution will indeed cause less temp variations, so this adds to my above points. Consider if it only took 1 hour for the earth to rotate on its axis. The difference between nighttime and daytime temps would be much smaller than with a 24 hr rotation. the same logic applies to a 12 hr rotation. There is a more even distribution of temps between daytime and nighttime, the faster the rotation of the planet. For example, consider what it would be like if earth took 180 days to rotate on its axis, so that day and night lasted 6 months each. Max temps in the daytime would be much hotter than at present and max temps in the nighttime would be much cooler than at present. Quite possibly the tropics would freeze during the nighttime. Sorry George but you totally missed the physical fact that the highest average temperature is obtained when there’s the least deviation from the mean. A faster rotating planet will have less diurnal temperature variation and thus a higher average temperature. Schumaker is quite correct about that. RGB: The total mass loss during the main sequence phase is negligible…not 20%. The Sun was never that much more massive. 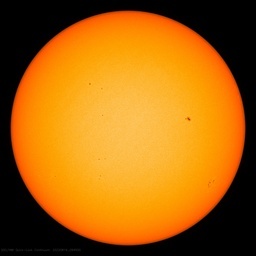 A more massive Sun is also brighter…luminosity is a very strong function of mass. This would help the idea of a more massive Sun supplying a greater density of power in combination with the orbital thing…but, mass loss is actually negligible during the main sequence phase and so neither of these ever actually occurred. It is very likely that the earth’s crust was thinner in the past, allowing for greater heat transport from the interior to the surface. As it is the crust in scale is today much thinner than the skin of an apple, and it is quite possible that there is more heat transfer from the interior to the surface than is currently believed. The big question is how much water there is BELOW the bottom of the oceans. Most likely water extends down through the crust, until it reaches boiling point under pressure. It could well be that the crust mantle boundary is the point at which water boils under pressure. Below this point the solid crust ends. At this point the dissolved limestone (CO2 captured long ago) is converted to hydrocarbons in the presence of iron and steam. Steam in the presence of iron releases hydrogen, which combined with carbon from limestone produces hydrocarbons. The excess oxygen is captured by the iron. The resulting hydrocarbons, being lighter than water then float upwards and escape into the atmosphere to become part of the carbon cycle once again, unless captured by a sub-surface rock formation. Thus, hydrocarbons are fossil fuel, they are created from fossilized CO2 captured in limestone. There is no shortage of iron. Iron is the stable byproduct of both fusion and fission. It forms the core of the earth, but this of course leads to the controversial question of the sun’s core. The earth’s core is evidence that there was plenty of iron in the solar system formation, so where did the sun’s iron go? How did the sun eject its iron? Why would it not be concentrated at the heart of the solar system during its formation by rotational forces? What was the mechanism? Or, is the iron still at the core of the sun? Why do solar scientists claim that the sun is 99% hydrogen by counting molecules instead of mass. The human body is 99% water molecules by the same methodology. What value is there in saying humans are 99% water by molecule count, unless you are trying to mislead your audience? Current solar mass loss rate from e=mc^2 and solar wind would only reduce its mass by 0.05% over 4.5 billion years. It takes several percent greater mass to explain faint young sun paradox which is a mass-loss rate about 100 times greater than today on average which means it would have 1000 times greater in its earlier history to get the 100 times greater average than today. This seems very unlikely and there’s no physical model to explain it. On the other hand Schumaker’s point about T4 relationship between temperature and power along with faster rotation rate is a physical fact that I trust even you won’t argue. The idea that you get a more even distribution of temperatures with faster rotation is not well explained. More even distribution in what dimension? For a given location, the insolation and total energy being absorbed is exactly the same, when averaged out. However, what will be different is the temperature swing between night and day. What it means is that any location will still come to the same temperature given the insolation, but the diurnal swing will be smaller. The average shouldn’t change at all. But then you also have the problem of atmosphere. Obviously, a very long day in which you would expect much night-time cooling can easily be made nearly non-existent (the cooling) when you have enough atmosphere. Such as on Venus. So, given the very strong effect that atmosphere has, completely dominating the rotational issue, it is a more dense atmosphere which is the most likely candidate, and which should be explored. As others have posted, there is good circumstantial evidence found in the biota of the period which indicate a denser atmosphere. The planet did rotate faster back then too, but this would likely be a second order effect on local average temperatures. The idea of a more massive sun and major changes in planetary orbits is not a factor, as the period being discussed takes place millions of years apart and after the formation of the early solar system. And depending on how the earth and moon formed, whether the Earth and moon formed together or if they formed separately as two planetary bodies that collided to form the Earth and moon. That’s not true John Doe. Look at your words. Less deviation from the mean doesn’t mean the mean becomes higher. It simply means the standard deviation about the mean is smaller. This doesn’t equate to higher average temperature. Sorry I don’t mean to use so many means when talking about the meaning of the mean. It would only correspond to a higher average temperature if the small-number side of the mean decreased its range. But in fact, both the max and the min would decrease with faster rotation, and so the effect on the mean should be small, if not outright negligible as expected from a simple mathematical perspective. You have to have fewer small numbers to increase the mean….not just a smaller deviation in general. The Bible says somewhere “With God one day is a thousand years and a thousand years is one day.”. And the Vedas say that one cosmic day and night of Brahma equals 8.64 billion years. I mostly agree — I was throwing out the break even point. The article Lief links puts an upper bound between 7 and 10%, but as you say the effect is multifactorial. One factor suggests that the luminosity was not, in fact, only 0.7 of todays (because the Sun was more massive). The other is that the orbital radius was smaller and hence insolation given the luminosity was also larger, proportional to mass squared. The main point is that these two factors very likely explain a fair fraction of the “missing insolation” — quite possibly more than half of it — even if the mass increase was only 5% or 7%. 1.07^2 = 1.14 so there’s half of it right there. But certainly earth did rotate faster back in geological time. Never mind geological time the earth was rotating faster last week! During the main sequence, which is well into when life started on the planet, mass-loss is negligible…as someone pointed out about, maybe 0.05%. I think it is even less than that. As you point out, though, it could help if we picked the right numbers, but, this is one of those “pull the numbers out of a magic hat which gives the right answer” kind of deals. We know that the atmosphere has a huge effect simply because it is a large thermal mass…it doesn’t need to trap heat it simply holds on to the heat it has, and will do so longer because there’s more mass. Like on Venus. Maybe they can start a new alarmism based on the increase of the mass of the atmosphere from increasing CO2. It will eventually get so massive it will crush us all! This is assuming the Sun we see today is the same sun in the past. The Saturn theory says Earth was in a polar configuration with Saturn that was a brown dwarf at the time before it entered the solar system.This explains why there were tropical forests at both poles.Earth only entered into this solar system about 12,000 years ago. To all criticizing my brief post: just do your homework and actually calculate the result. There is great diversity of day/night temperature difference, greatest in tropics and zero on poles. I did not spend my time integrating over that but so didn’t the author or I’d expect to see his math in the article rather than that crude and misleading example. If I assume whole earth has exactly its average temperature of about 14°C and it has diurnal temperature variation 80°C (i.e. nighttime temperature is -66°C and daytime is +94°C on the whole Earth surface; notice how stretched that example is) then the black body radiation would be just 12% more than if there was no difference between daytime and nighttime temperature at all (two times faster rotation can’t achieve that). And we still have some 18% to go to meet that 30% lower sun output. So sure, if the sun output was 70% of today’s in these historical times, then faster earth rotation probably played some role. But I’d call it negligible. Well, the Earth was closer to the Sun. Now it is receding about 15 cm per year further away from the sun. At the same step it makes only about 0.1% of the Sun Earth distance in 1 billion years, but was the movement constant? Or more accelerated in an early Earth? Second – how much of the Earth was covered by the oceans 1 billion+ years ago? The true greenhouse happens in the oceans where the sun radiation is warming in depth but losing warm only at the surface. The effect of higher mean temp on a faster rotating orb is because energy loss is greater when darkness begins at a higher temperature. The slower rotating orb gets warmer during the day and due to T4 relationship between power and temperature when the hotter dayside rotates into the night side it loses energy faster. The highest average day/night temperature is thus obtained when there’s the least diurnal temperature swing. If this weren’t correct Duke U physicist Rob Brown would have been quick to point it out. The flaw Schumaker’s hypothesis is there isn’t a whole lot of diurnal temperature change over the global ocean and in fact the diurnal change in temperature over the ocean is so small that that you can basically ignore the T4 slope. If we were talking a diurnal swing of 300C over the entire orb (like the moon) then the average temperature change becomes significant. Rob Brown and Willis talk about it in the links above if you’d like a more in depth explanation of how, why, and magnitude. Man, there’s a lot of handwaving in this thread. Eye protection is recommended. How much was it 1 billion + years ago? There are several factors that contributed to the young Earth being warm that are forgotten and people try to find one factor that explains it all – and clearly the CO2-zelots point to CO2. The CO2 shows however no correlation between CO2 quantities and historic temperature. Well John Doe, i suggest you read YOUR statement immediately above; and reread my two posts carefully. Just for starters, nowhere did I say anything about the correctness or otherwise of Schumaker”s statement. But that statement as you stated it above: “””””…..
A faster rotating planet will have less diurnal temperature variation and thus a higher average temperature. Schumaker is quite correct about that…….””””” is plain nonsense. Schumaker (and apparently YOU) make the statement that two entirely different data sets must have different averages, and that the data set with the smallest range of values must have a higher average value. You can’t change the entire data set (which changing earth’s rotation rate will do ) and then assume that they are related to each other. And if you reread my first post, you will see that I explained that feedback effects will totally change the conditions. I DO agree with ONE aspect of Schumaker’s argument. If you have two earth Temperature data sets (let’s just say as a result of earth rotation rate); that have …….EXACTLY THE SAME AVERAGE TEMPERATURE…… then the case with the highest low to high Temperature range, WILL have THE HIGHER TOTAL COOLING DUE TO RADIATION. That’s an elementary consequence of the S-B 4th power law. Even a square law would give greater cooling with a greater p-p Temperature range. Anybody who has ever done much in the way of power calculations, computing RMS , Avrage or peak values of Voltage or current , fully understands that. Temperature average does not translate to cooling rate. Earth is cooled most efficiently by the hottest tropical deserts; NOT by the icy polar regions. But my biggest disagreement with Schumaker’s thesis, is he ignores the feedback effects that totally change the game plan. I INFER from that comment, that (a) there once was a faint young sun; and (b) the earth was not a frozen ice ball at the time; ergo a paradox. There are NO paradoxes; just unexplained phenomena. The very mention of this paradoxical situation implies that other feedback effects regulate Temperature despite Insolation changes; and I simply point out that Schumaker ignored that. Yes well I’ve actually modeled what you describe and only found the diurnal range to become smaller or lager while the oscillation itself remained peg at almost the exact same mean value. Yes there is some tiny variation on the mean because of the non-linearity of T^4, but because we’re at or near equilibrium, the heating and cooling occurs at almost the exact same rate…the slope of the heating portion during the day is the same as the slope as the cooling portion over night, because we’re oscillating about the equilibrium….it can’t occur any other way. I modeled a normal day and a day twice as fast; the result was a larger vs. smaller diurnal range in temperature because there is more and less time for heating and cooling, but the diurnal oscillations themselves centered on nearly the same value…only a fraction of a degree difference, given a 100% change in rotation rate. True that with faster rotation, the day side would heat less but the night side would equally cool less giving a more even temp distribution between the day and night sides which will lead to a higher average. [6 4 6 4] has an average of 5. [7 3 7 3] has an average of 5. The diurnal range is smaller or larger, but the mean is the same. Because the range extremities are different there will be some effect on the mean because of the T^4 dependence on heating and cooling where the one range exceeds the other, but, these are both also occurring at (very near) equilibrium and so the heating and cooling slopes are basically identical (equal magnitude, just reversed day vs night). So the effect on the mean is negligible because heating and cooling occur at the same rates around equilibrium. A smaller range about the mean does not equate to a different mean, by definition. The T^4 effect is very small given the diurnal range difference, and because the oscillations are occurring about the energy equilibrium. Ayn Rand noted that a paradox can only exist when one of your prior assumptions is incorrect. I haven’t seen any comments on the higher level of radioactive decay heat in the early years of earth. Thorium 232 has a half-life of 14 billion years, so there would be only a little more heat in early history, but u-238 has a half-life of 4.5 billion years. The decay heat from the u-238 would have been double in early earth, compared to present. Professor, will “all of the above” be an acceptable answer on the mid-term? Do we know the distance from the sun back then? Another factor is that the heat flow from the interior of the plant was greater. Tides were greater as well due to the fact that the Moon was much closer to the Earth. As in most things in science, to try and pin any one factor down is atp to obscure rather than illuminate the truth. If the Earth rotated at 24/14 times the present rate, I would expect the AVERAGE temperature to be exatly the same, but the temperature RANGE to be reduced significantly. Probably to ~60% of the current range. Of course, when it happens to be cloudy, the RANGE will be even less. Let’s also remember that the Earth did, in fact, freeze over about 80% in at least 4 different time periods. The first Snowball was 2.4 billion years ago as the rise of Oxygen occurred and again at 2.1 billion years ago as Oxygen increased again. The landmasses were just becoming large enough at that point to hold large land-based glaciers. It is possible that ocean currents would have been constantly sweeping sea ice away from the poles to melt at the equator before this time so the impact on global Albedo may not have been that high before the landmasses could accumulate high-Albedo land glaciers. So the lack of Oxygen and the lack of large landmasses are part of the explanation. The author seems right, it would be a warmer globe spinning faster, but there would also be other factors some two billion years ago as many have raised above. One is a thicker, denser atmosphere, this is generally accepted as true and mentioned by many above. A second factor is the effective emissivity of the Earth that I hear raised very rarely. A surface with a constant radiative input will heat up to a point where equilibrium is reached but that particular temperature is emissivity dependent. The lower the emissivity the higher the equilibrium temperature but it will also take longer for equilibrium to be reached due to the inverse lower absorptivity. Most of the hypothetical ‘33C’ GHE is due to the fact that this globe is NOT a blackbody radiator. The equilibrium temperature is then by definition is much less that the consensus of 33C on GHGs hugely due to water vapor. Really the 33C is closer to a 134C boost calculated properly and the effective emissivity is much less than one and is density dependent (the thickness or mass of the atmosphere). Climatologists seem so shallow in science. They concentrate on singular factors without ever bringing in to play all of the real effects present in the explanation of our ‘climate’. But I so take the author’s point that one of these factors was bound to be the increased rotation rate. The criticisms against my simplistic post are valid. I only wanted to convey the idea as simply as possible, not come up with a realistic estimate, which would have been tremendously difficult. Apparently a faster rotating Earth has more reasons to be warmer (such as fewer clouds) than just reduced temperature variance. So for those wishing more complexity, they should seek out the paper associated with this article (and post the link here if they find it). I was also going to write about primordial heat and radioactive heat and how this heat would have been released at a much faster rate for an young Earth, but that would have polluted the one main idea I wanted to convey. Devils advocate: Have we ever witnessed a “dim sun” , ever seen one of these dim suns get brighter? Have we seen a red giant go white dwarf? A yellow sun turn red giant? NOPE. Could be the initial theory is wrong.. it is all just theory. Just sayin.. Yes if clouds start changing frequency then you don’t have a situation of “all things being equal” anymore, because the absorptivity has changed. This is of course far different than the direct mathematical analysis of number variations themselves. Let me try to resolve a bit of this with some numbers. Most of the planet is ocean. How much does the ocean temperature change day to night? 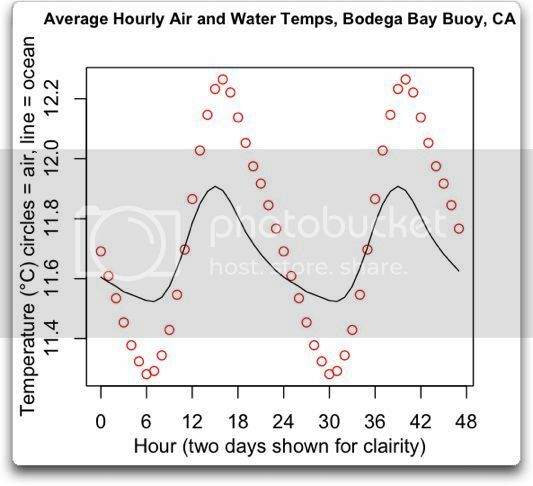 Here’s the average day-to-night temperature swings at the Bodega Bay buoy, offshore from where I live. The climate is typical for the Pacific Ocean off the north coast of California. This is the average of 27 years of data. As you can see, the average daily swing for the ocean around here is small, about 0.4°C top to bottom (or ± 0.2°C). Where P0 is the average amount emitted with no variation in temperature, and P1 is the average amount emitted when the temperature is varying. T is the temperature, in kelvins, and delta-T ( ) is the change in temperature up and down (half of the temperature range). In other words, yes, the day/night variation is a real phenomena. The problem with the Schumacher theory is that the day/night variation in ocean temperature gives a change in radiation that is so small as to be lost in the noise … and the world is 70% ocean. Even if you doubled the swings to allow for the land, it’s still way too small to affect anything. PS—I found similar day/night temperature excursions (well under one degree C) in the data from the TAO buoys. See here_1 and here_2. FYI, the temperature swing on the moon is 300C (and K too). I already explained early this morning that there was only 1C diurnal swing over the ocean and only 10K over land which makes the effect of rotation speed insignificant. That said the thermal inertia of the ocean does have a significant effect. If the moon rotated as fast as the earth it would still have a ~75K diurnal range. Everyone seems to be talking about heating rates but surely the evidence of the Moon, with temperature swings approaching 300 degrees C from night to day (-173 to +123), shows that for a planet rotating in a radiation field the really important variable is the amount of time planetary surfaces are “shaded” from the radiation field – after all once the temperature reaches the maximum the radiation is capable of no more heating occurs – this is what the SB equation shows – the maximum. If a planet rotates faster its night side has less time to radiate the energy away – the rate of energy gain or loss changes with temperature and the planet’s radiation is always less than the radiation field. Also surely the Moon shows that the oceans and atmosphere on Earth reduce the heating potential of the solar radiation during the day as convection and evaporation move energy from the surface to the upper atmosphere while the oceans reduce the cooling potential during the night due to the properties of water. The Earth might have been spinning even faster. Recent work has found a way for the Earth-Moon system to lose angular momentum. It’s mentioned in the following summary, as being a reason why new Big Splat studies are being done — there are more kinds of Moon-forming collisions possible when the Earth is left with a faster rotation rate. Agreed, temperature variability probably not important for the ocean. Presumably ocean temperature changes so little because of evaporation, which create clouds. A faster spinning Earth would most like then have fewer clouds. Fewer clouds, hotter Earth. Maybe? 3.6 billion years ago simple cells (prokaryotes) appeared. 3.4 billion years ago stromatolites demonstrating photosynthesis appeared. 2 billion years ago complex cells (eukaryotes) appeared. 1 billion years ago multicellular life appeared. 600 million years ago simple animals appeared. 570 million years ago arthropods (ancestors of insects, arachnids and crustaceans) appeared. 550 million years ago complex animals appeared. 500 million years ago fish and proto-amphibians appeared. 475 million years ago land plants appeared. 400 million years ago insects and seeds appeared. 360 million years ago amphibians appeared. 300 million years ago reptiles appeared. 200 million years ago mammals appeared. 150 million years ago birds appeared. 130 million years ago flowers appeared. It’s just another hypothesis that had to “enhance the greenhouse effect” to compensate for the lower solar luminosity for it to work. But it failed! Thanks for the nice timeline summary, which is new information for me. Going to put in my notes for future reference. Also a note. 30% fainter sounds like a lot (and it is), but again, because of the T4 relationship, temperatures would not be 30% less, but only about 1/4th that or 7.5% less. I used the 30% fainter estimate because I read it was a figure the late Carl Sagan came up with, their are probably more up to date estimates. The dim sun paradox is really the “how can people be so stupid as to believe in climate forcing” paradox. What the dim sun paradox tells us is that you cant really force the climate – or, more precisely, that even a “forcing” of a change of 25% of solar output fails to force the climate – something more than this would be needed. Climate is robust and negative feedbacks keep its temperature within a life-supporting range. NO !!! HELL NO !!! Crystal clear is when it is coldest. When it is cold, there is no evaporation to form those clouds; THAT’S WHY IT IS CRYSTAL CLEAR !! Now when it is HOTTER during the day (and humid) you get evaporation which will condense as clouds WHEN IT COOLS DOWN AT NIGHT; and it WILL cool down at night. So agimarc why don’t you wake us all up; from “up there” if and when you have a nice cold low humidity day and no winds, AND IT WARMS UP AND FORMS CLOUDS AFTER SUNDOWN. Ian, my apologies for misspelling your name; I should be more careful. And I hope you don’t feel set upon. I think if you had kept the average Temperature of your two cases, exactly the same, one having a greater spread than the other, and pointed out that the greater spread case is going to radiate more in toto, as a consquence of the S_B law, you would be on the right track; but you see everything else is simply not going to stay the same; and changes in cloud feedback is just one of the things that is going to screw up any simple situation. Don’t forget, since we had any weak young sun (so far as I’m aware) all of the continents have shifted all over the place. No way could the climate stay the same. No, it changes so little because sunlight penetrates to a depth of about a hundred meters to heat it spreading the energy out through a lot of mass. The temperature of that whole column has to fall at night because of convection i.e. if the surface cools a little it sinks and is replaced by warmer water from below. So you have a water column a hundred meters deep that is resisting change in temperature. On the other hand rocks and soil don’t convect and sunlight can’t penetrate below the surface so you only have a column less than a meter deep resisting diurnal temperature change. especially the timeline. The faint sun paradox addresses the hadean through the archean and proterozoic, but especially the archean. Life appeared at the beginning of the archean, at least some 3.5 Bya (there is some speculation that it is even older). The “paradox” is simple: The Earth “should” have been frozen solid, assuming its current orbit and a sun with an output that is only 70% of its current output. Yet there is abundant evidence of liquid water dating back to the beginning of the Archean (that’s what defines its boundary, in fact) and life kicked in almost immediately in terms of geologic time once there was liquid water. Since that point, there has always been liquid water, meaning the the planet never froze solid when it “should” have, given stellar evolution of the sun that is consistent with what we observe in astronomy. Hence the paradox. The timescale of the problem isn’t millions of years, it is billions of years, across major changes in the composition of the atmosphere (when life first appeared there was little free oxygen in the air). Of course astronomical observations have a hard time being precise about things like the rate at which young stars cast off material, so we have no more than estimates of the rate at which the early sun lost mass, hence we do not know very accurately what its original mass was, hence we do not know either what the early orbits of the planets were relative to the Sun or how bright the Sun really was. The stellar evolution sequence considers stars of similar mass and their progression, but it has to make assumptions about how a star cuts across the http://en.wikipedia.org/wiki/Hertzsprung%E2%80%93Russell_diagram as it evolves. In particular, it is assumed that a star like the Sun starts out on the main sequence, then moves up and to the left along the main sequence during its lifetime (ending eventually as a red giant). However, this assumption might be mistaken — it might start up on the main sequence and sit there without significant changes in its luminosity (or with slower, smaller changes), casting off mass to partially cancel what would have been progress up and to the left. There are a variety of other “stellar” scenarios that could explain and resolve the faint young sun paradox — infalling matter as the new sun swept up and ate that portion of the surrounding interstellar medium above the critical size threshold where light pressure pushes it away, a process surely much stronger in the first 2-3 billion years after formation than it is today, as evidenced by the lunar surface and the fact that moon itself resulted from a planetary scale collision. I would rather expect that entire planetary objects fell into the early sun more or less intact during the first billion years (out through the archean). Perhaps some fraction of solar variability in the present is leftover “ringing” from just such a collision, given that the sun is so dense as to nearly be “rigid” in much of its interior. Or, perhaps mercury began its existence as a gas giant — we have plenty of evidence that stars often have very large gas giants in very close orbits — and the sun was continually fed by that gas giant outgassing until it depleted it a Bya or so. We’d have to visit mercury to even think of finding evidence for that, but it is a perfectly plausible core for a gas giant that has lost its entire atmosphere, some of which was blown away as solar wind, some of which spiralled in to feed the young sun. And then there are atmospheric composition theories — early atmosphere largely greenhouse gases (and much denser) sufficient to keep it warmer than one expects assuming Earth then is “like” the Earth now. It probably wasn’t. There are leftover heat of formation/moon collision theories — a more geologically active Earth stayed hotter. Tidal heating theories — the moon (half the distance away) would have produced tides 8 times stronger than they are today, causing much greater deformation of the crust and a lot more heat. More radioactives. Basically, there is no lack of possible explanations of the “paradox”; there is a lack of data to help choose between them, and several of them might have all contributed anyway. o agimarc why don’t you wake us all up; from “up there” if and when you have a nice cold low humidity day and no winds, AND IT WARMS UP AND FORMS CLOUDS AFTER SUNDOWN. Actually, it sometimes does something very close to this, because humidity is relative humidity. It can be a nice, clear day with a relative humidity that is low but a higher absolute humidity, the sun can go down, the air cools and clouds form, and as they precipitate they release the heat of vaporization into the surrounding air. The same thing happens on the ground as dew forms — the droplets warm the air as they precipitate out. The clouds thus formed also form a greenhouse canopy and at night slow the flow of surface heat out to space. That’s one thing that several posts above have ignored. Clouds aren’t “simple” — they don’t always (net) cool, they don’t always warm. During the day in the tropics through the temperate zone, they tend to net cool by reflecting sunlight before it hits the ground or ocean and is absorbed (high albedo). During the night and near the poles they tend to net warm by greenhouse trapping of heat — I learned all the way back in boy scouts when CAGW wasn’t even a twinkle that cloudy nights are rarely as cold as clear nights, and humid nights are rarely as cold as dry nights with or without clouds. There is further variation on net warming/net cooling according to WHERE the clouds form in the troposphere. It’s a major problem with the presumed strong positive water vapor feedback in the IPCC catastrophic warming scenarios — clouds are so complex that we don’t really know that we have the SIGN of the feedback right (and the sign might change with macroscopic drivers like the global oscillations or variations in oceanic heat flow!) let alone that water vapor increases will more than double the presumed all-things-equal CO_2 doubling warming of a degree K or so. Note that I don’t pretend to know the answer here either. I don’t find any of the descriptions of how the water cycle (including oceanic heat uptake and loss and redistribution via currents with timescales and turnovers up to a thousand years long) affects global climate particular convincing. It’s an insanely difficult problem, and we probably don’t even have the instrumentation to take the data that would help us figure out the solution yet. Cloudy areas do seem the warmest – true. What about a desert though? They are cool at night also and would have an increased average temperature with a shorter day. I think we are having a glass half empty / half full sort of argument. My poorly made final point was: Cloud cover is more complex than a simple reflection of incoming or outgoing energy. Altitude of those clouds is also important. For example, there are times in the northern climes with very cold temps and very high relative humidity. You end up with ice fogs, fogs and hoarfrost (which nicely glazes the local roads). In this case, the clouds are right at the surface and not particularly thick, neither reflecting anything much from the sun (mainly due to low incoming incidence angle of sunlight) nor keeping surface radiation from escaping. What was it Richard Feynman said: something like; if your theory disagrees with experiment, then it is wrong. So since the earth was not (apparently according to experimental data) “frozen solid”, then the theory that it should have been, is clearly WRONG under the Feynman doctrine. Ergo the earth should not have been frozen solid, since it was not. So the day is cold and low humidity ergo low atmospheric water content. Presumably the formation of those clouds resulted from the surrounding upper atmosphere (cold) having extracted LATENT HEAT from the water VAPOR in the atmosphere. Gee I guess the “heat” flowed from warmer (higher Temperature) to cooler (lower Temperature) just as the Second Law predicts. I can see how “heat” is transported from near the surface to a greater altitude which is colder, and to an even colder higher altitude, if the near surface humidity was lower (during the sunlit day); but I’m having difficulty figuring out how the near surface Temperature continues to rise after the sun has shut down its source of energy. But that’s why I’m here; to learn these things. For the near surface Temperature to RISE after sundown, some form of “heat” energy has to arrive there from somewhere else. Convection is out; no winds, so no moving mass of hotter air coming in from somewhere else. The moisture in the air is rising, specially if the surface Temperature is rising; and this is REMOVING “heat” energy from near the surface to be deposited higher up. Even if ALL of it returned to the surface by some as yet unexplained process (zero losses), it couldn’t raise the surface Temperature above what it was before that energy first left the surface. It CAN’T ALL return as “HEAT” without special dispensation from the keeper of the Second Law; and it can’t ALL return as radiation, since any upper atmosphere source of such radiation would of necessity be essentially isotropic , so only about half could return. Ergo it can’t bring the surface Temperature above what it was at sundown. But I’m happy to learn how this can happen. YOU maybe having such an argument; I am NOT. I’m saying quite succinctly, that the 6PM weather reports that say “it is going to be a high cloudy evening; so it will be warm and muggy” have it completely backwards. BOTH the CLOUDS and the MUGGY WARMTH are a direct CONSEQUENCE of the simple fact that it WAS HOTTER AND MUGGIER during the daytime BEFORE that high cloudy muggy evening. The Temperature WILL go down after the sun sets. I agree the height of the clouds that form, whether zero or 50,000 feet is a function of the Temperature and humidity profile. The text books all say that the higher the clouds the more the warming; NO ! the more the warmth near surface , the higher the moist air has to rise to get down to the dewpoint so clouds can form. Seems like someone is forgetting the surface and near surface temps were a lot hotter then also. I’ve discussed this subject for many years. The reasons the Earth was at a relatively similar global temperature to today was not only the fact that oceans covered more area than they currently do, but the planet rotated on its axis at a much faster rate. This gave forth a ‘Super Coriolis’ effect yielding much faster jet stream winds and ocean currents. So not only were there more oceans, they transferred heat from equator to pole much quicker, due to the faster rate of speed ocean currents brought warm waters north. I’m glad someone finally presented a paper about this. As I mention in this comment from an article 7 months ago, I’ve been talking about this for years. I put forward this hypothesis with some rough figures in comments to Willis’ post The moon is a cold mistress http://wattsupwiththat.com/2012/01/08/the-moon-is-a-cold-mistress/#comment-858665 . I think that Willis counterargument above reduces the magnitude of this effect but does not remove it. There are large parts of the world with a much larger diurnal range than the sea off California. I’d therefore say that this hypothesis is one of several factors which PARTLY resolves the faint sun paradox. It seems to me the earth is always gaining mass from meteorites, dust & comets. This additional mass would both slow the rotation and increase the orbital radius over time. I gotta admit, I grow weary of providing numbers for people that should provide them themselves. So no, this is still a long ways from being a factor which resolves anything … the changes are way too small to make a meaningful difference. Regarding the projected changes in temperature from the doubling in rotation speed, it’s about a half a tenth of a percent. A swing of ± 5°C makes a change in average temperature of about 0.2°C … tiny. Me, I divide factors into three levels—first order, second order, and third order. Some factors can change a variable of interest by more than 10%. I call these first order factors, they can make a big change. You always have to include these factors. Second order factors make a change from one to ten percent in the variable of interest. They are not large, but you can’t ignore second order factors in a more detailed calculation, particularly if there are a number of them. Finally, there are the third order factors. These can only change the variable of interest by less than one measly percent. In general, these factors can be safely ignored in any but the most precise and accurate of analyses. So when the “fast rotation” theory comes along, and it only changes the radiation by much less than a percent, I have to say it’s a third order factor at best. How sure are we that there is a paradox to solve with a young sun based on observations of young stars? Yes, variability is too small to be a factor. You made your point. But perhaps you are a bit too quick to dismiss fast rotation as a factor for other reasons? Did you look at the article pointed to by Henry Clark? I know this isn’t ‘my’ variability cause-and-effect, it’s something completely different. We have a lot of theories, but we know almost nothing about early Earth (we still have no idea how the moon came to exist even). What we do know is that we have a paradox. A paradox means that one of the things we think we know is wrong. That’s why paradoxes are awesome. Something in our understanding is wrong so we shouldn’t be too sure of ourselves about any of the things we currently take as ‘fact’ and we should keep an open mind. For instance, it strikes me as very odd that we still do not know exactly why the Earth goes into and out of ice-ages. Earth A, warm and cozy. Earth B, frozen wasteland. Same Earth, same Sun, same ocean. What’s causes the difference between the two? We really have no idea. It strikes me as odder still that people don’t even seem to care that we can’t explain this, yet feel perfectly comfortable putting forth this theory or that theory about why some utterly minor variation occurs. If we can’t solve that major puzzle then we really should admit to ourselves that we know almost nothing. Yes, variability is too small to be a factor. You made your point. But perhaps you are a bit too quick to dismiss fast rotation as a factor for other reasons?Did you look at the article pointed to by Henry Clark? Thanks for the reply, Ian. I fear that I pay little attention to what various climate models have to say will happen under imaginary circumstances. In this case, the idea that the models could even indicate that “storms and clouds” would be confined to the Equatorial area seems unlikely, given that both storms and clouds are well below the modeled gridbox size, and are not modeled directly. … For instance, it strikes me as very odd that we still do not know exactly why the Earth goes into and out of ice-ages. Earth A, warm and cozy. Earth B, frozen wasteland. Same Earth, same Sun, same ocean. What’s causes the difference between the two? We really have no idea. As far as I know, entry into and exit from the ice ages is explained, at least to a first order, by the Milankovich cycles … am I missing something? I agree with Ian Schumacher when he say’s (within context) “a paradox means that one of the things we think we know is wrong”. And Ian is correct! all things being equal, there should not be a so-called paradox. Ian please do a follow up on this. Unfortunately to understand most of the past we have little choice to but to use models – guided of course by the very little empirical evidence we have. It’s either that or just throw our hands up and say “we will never know”, which very well might be true. Milankovich cycles, are correlation, not cause and effect. The correlation in some areas of Earth’s past are so good that we must assume a cause is there somewhere, but from my reading it isn’t nearly as clear-cut as you imply. The contribution of orbital forcing to ‘variance’ in season changes, for example, is minor. As minor as a little more or a little less CO2 some might claim (in which case we should probably be in a cold phase right now), or a large volcanic eruption. Also “the ‘traditional’ Milankovitch explanation struggles to explain the dominance of the 100,000-year cycle over the last 8 cycles.” – quoted from Wikipedia (with apologies). If you believe I’m wrong and there is certainty, then when will the next cold phase of the ice-age start? I’d greatly appreciate knowing since it seems rather important (if within mine or my children’s children’s lifetimes). Strangely I can’t seem to find any answer to this on the internet, but perhaps my searching skills are not what they should be. p.s. Doing more research. Apparently we also really have no idea where the water for the oceans came from. So, in fact, I beginning to question if we even really know if early Earth was entirely covered in ocean. I suspect now it is a strong hunch only. I’m willing to admit that perhaps it is only me that knows almost nothing, in which case I do welcome being ‘kindly’ informed of how the world really works outside of Wikipedia. Thanks, Ian. I fear you are presenting what is known as a “false dichotomy”. The false dichotomy is that we have only two choices when it comes to understanding most of the past—use faulty computer models, or throw up our hands and give up. I fear that your point of view would have been incomprehensible to most scientists in history, for a simple reason—they didn’t have either computers or computer models. And according to you, to understand most of the past, it is a requirement to have computer models, because if we don’t have computer models (again according to your dichotomy) we might as well just quit. Throw up our hands. Walk away. I gotta admit, sometimes I fear for the new generation of scientists. Seems like they think that nothing is possible without email and google and smartphones and computers and the like. So let me make it clear. Often, computers are not better than nothing. Sometimes they are much worse than nothing. And the results from said computers are not evidence of anything. Yes, we should use them. But no, far too often their results cannot be trusted. The part that mystifies me is why people don’t ask for the bona fides of any given computer program. Instead, they blindly take any random computer results and assume that they have meaning, that they are valuable, that they are better than flipping a coin … whereas in fact, it is quite possible that such results are meaningless, valueless, that they lead you down the wrong path, and that you’d be much better off flipping a coin. [blockquote] Thanks, Ian. I fear you are presenting what is known as a “false dichotomy”. The false dichotomy is that we have only two choices when it comes to understanding most of the past—use faulty computer models, or throw up our hands and give up. Ian, regarding Milankovich, take a look here for some recent thought on the subject. I’m afraid you are being very narrow minded about what comprises a ‘model’. Kepler’s laws are a model, Newton’s laws are a model. Rutherford’s atomic model, is a model. All ‘wrong’ strictly speaking, but very useful approximations non-the-less. I definitely did not mean ‘computer model’ only. Although, just because it runs on a computer that doesn’t make it automatically wrong either. You’ve been blinded by the failure of climate science to think that all computer models are useless (I guess someone needs to tell the circuit designers they need to do it all by hand from now on). Computer models are tremendously useful and should not be shunned en-masse just because of a failure in an area of chaotic dynamics, in which we probably should expect them to fail. – you make a good point. Perhaps these never apply to you, in which case you should definitely use your omniscience in giving us specifics. Like when the next ice-age will occur – and so on. Unlike certain others who’s name may occasionally be mentioned at WUWT, I’m happy to acknowledge when I’ve got a sign wrong in one of my parameters. Diurnal range decreases with latitude, not increases as I had it in my rough calculations. Rotation speed is a first order effect on a cold dry mistress of a moon, a second order effect on a warm soggy earth if you get your sums wrong, and a third order effect here. I’m afraid you are being very narrow minded about what comprises a ‘model’. Thank, Ian. Yes, you are right. I am speaking about a specific type of model, the computer-based iterative climate model that was used to produce the results described in the study under discussion. I’m sorry, I thought that would have been clear from the context. Kepler’s laws are a model, Newton’s laws are a model. Rutherford’s atomic model, is a model. All ‘wrong’ strictly speaking, but very useful approximations non-the-less. I definitely did not mean ‘computer model’ only. Although, just because it runs on a computer that doesn’t make it automatically wrong either. You’ve been blinded by the failure of climate science to think that all computer models are useless (I guess someone needs to tell the circuit designers they need to do it all by hand from now on). Again, you are right, I am discussing the specific type of model used in the paper. Your accusation that I think that “all computer models are useless”, however, is completely untrue. I have been writing computer programs for fifty years now, I’ve written a host of models of physical and financial systems. I know their pluses and their minuses as a result of spending far too many hourssitting up late at night and debugging them. I am or have been fluent in a variety of computer languages—Basic, Pascal, C, LISP, Fortran. Mostly these days I write in R, Visual Basic, Mathematica programming languages, and Pascal. I have created and run models on the STELLA platform. I both write and use a host of computer models for a variety of tasks in my scientific research. Clearly, I don’t think “all computer models are useless”. My objection is to the untested, unverified, unvalidated Tinkertoy™ global climate models. Truly, I don’t care if the model in this study clusters model storms at the model Equator when the model Earth rotates at twice the Earth’s speed. The next model could easily say the opposite. Look at the model predictions of the areas of rainfall changes with warming … some say increased rain in the same area where other models say increased droughts. So until their whiz-bang model can be shown to be valid for novel situations (not merely replicating data it was trained on), I treat it like I treat the stories of Tibetan monks levitating … interesting, but not meaningful. Anecdotal, not scientific. I’m completely with you on the uselessness of Tinkertoy climate models. I did object to your dismissing the computer model used in this case, only to turn around as say “how it would really be”. That came across as a bit arrogant and I apologize if I interpreted that incorrectly. Also I wanted to emphasis how little we know. I used Ice-ages as an example, (of which we do know something, just no details about the actual mechanism). I could have used a safer example of which there are plenty. Also, regardless, there is a paradox. I may have missed your explanation for the paradox, but even given your considerable knowledge and intelligence, I would still have to say ‘maybe’. Until it’s backed up by some good math (which may or may not be put into a computer model), some predictions, and the discovery of previously unknown empirical evidence to back it up – it’s all just conjecture and we shouldn’t be too keen on shooting down other theories so quickly. Let’s just say ‘maybe’. There is no harm in it, and it might actually be right.